Vertical velocity and acoustic backscatter measurements by acoustic Doppler current profilers were used to determine seasonal, subseasonal (days to weeks), and diel variation in suspended solids in a freshwater lake where massive cyanobacterial blooms occur annually. During the growing season, the suspended material in the lake is dominated by the buoyancy-regulating cyanobacteria, Aphanizomenon flos-aquae. Measured variables (water velocity, relative backscatter [RB], wind speed, and air and water temperatures) were averaged over the deployment season at each sample time of day to determine average diel cycles. Phase shifts between diel cycles in RB and diel cycles in wind speed, vertical water temperature differences (ΔT°), and horizontal current speeds were found by determining the lead or lag that maximized the linear correlation between the respective diel cycles. Diel cycles in RB were more in phase with ΔT° cycles, and, to a lesser extent, wind cycles, than to water current cycles but were out of phase with the cycle that would be expected if the vertical movement of buoyant cyanobacteria colonies was controlled primarily by light. Clear evidence of a diel cycle in vertical velocity was found only at the two deepest sites in the lake. Cycles of vertical velocity, where present, were out of phase with expected vertical motion of cyanobacterial colonies based on the theoretical cycle for light-driven vertical movement. This suggests that water column stability and turbulence were more important factors in controlling vertical distribution of colonies than light. Variations at subseasonal time scales were determined by filtering data to pass periods between 1.2 and 15 days. At subseasonal time scales, correlations between RB and currents or air temperature were consistent with increased concentration of cyanobacterial colonies near the surface when water column stability increased (higher air temperatures or weaker currents) and dispersal of colonies throughout the water column when the water column mixed more easily. RB was used to estimate suspended solids concentrations (SSC). Correlations of depth-integrated SSC with currents or air temperatures suggest that depth-integrated water column mass decreased under conditions of greater water column stability and weaker currents. Results suggest that the use of measured vertical velocity and acoustic backscatter as a surrogate for suspended material has the potential to contribute significant additional insight into dynamics of Aphanizomenon flos-aquae colonies in Upper Klamath Lake, south-central Oregon. 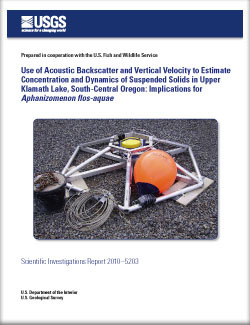 Wood, T.M., and Gartner, J.W., 2010, Use of acoustic backscatter and vertical velocity to estimate concentration and dynamics of suspended solids in Upper Klamath Lake, south-central Oregon: Implications for Aphanizomenon flos-aquae: U.S. Geological Survey Scientific Investigations Report 2010–5203, 20 p.